Miss Zagarpur is yet another local designer, who works in the challenging field of fashion for the Muslim ladies. 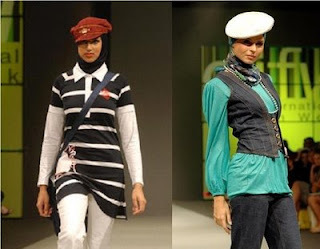 She creates clothing that can be fashionable and at the same time abide by the rule of "cover"(legs, arms and hair should be fully covered). Rabia Zagarbur was born in Dubai, moved to USA and then came back. 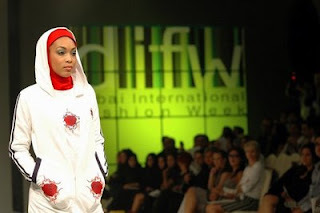 She is a graduate of local Fashion Institute and, which is quite impressive, collaborated with Adidas in 2007 for Dubai International Fashion week. Her inspiration is to be able to dress Queen Rania - now that's a tall order - and she believes that Beyonce is the best dressed woman in the West. I say "Hmm..." to that one. Anyway, here is some of her work. The hoodie in white and red is for Adidas, i think.